USA Happy Mail Goodie Package! 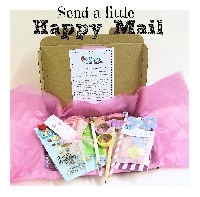 Please fill a 9 1/2 in x 12 1/2 in padded flat rate envelope with Happy Mail! It may be helpful to look at your partner's profile and check their interests before sending as well. Any ratings requirements, or can just anyone join? Will you angel the swap if someone doesn't receive their swap from their partner?